Post news Report RSS	Pre-Alpha 11 Unstable is now available! Hello everyone! We are proud to announce that Pre-Alpha 11 Unstable is now available for download to everyone who pre-ordered the game. This is a huge update that brings the game to an almost feature-complete state. So, welcome to an almost completely new game experience! We are proud to announce that Pre-Alpha 11 Unstable is now available for download to everyone who pre-ordered the game. This is a huge update that brings the game to an almost feature-complete state. So, welcome to an almost completely new game experience! Among all that was added and improved we highlight the overhaul of the starmap and system view, the addition of race customization, espionage, events, random tech trees, a new playable race (the Sulak) and a completely new soundtrack produced by Grant Kirkhope and Ryan McQuinn! There's also 12 new leaders, new and improved ship 3D models and new race looks and animations, among many other things as you can see in the release note below. Please let us know your thoughts on this release as for your criticisms and suggestions for improvement. Note: Save games from Pre-Alpha 10 are not compatible with this new version. 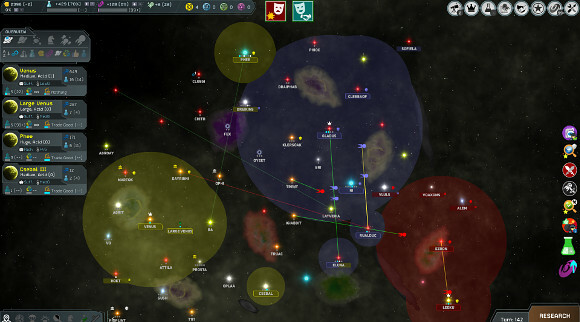 Interstellar Space: Genesis is a new turn-based space 4X strategy game currently under development by Praxis Games. The game is currently at Pre-Alpha and pre-orders with instant access are open! Feel welcome to open threads and discuss any topic you’d like in the game forums. We’re making the most complete and comprehensive Turn Based Space 4X ever developed, and we count with your support to make it happen! So, please tell your friends about ISG, people who loved Master of Orion but also space 4X games or strategy games in general. Pre-order and play ISG today, and soon you will Discover the Unknown. Thanks! Race customization added! - You can design your own race with the abilities of your choosing! Espionage mechanic added! - Send your leaders in espionage missions. Steal tech, bribe other leaders, conduct sabotage and gather intel on your rivals. 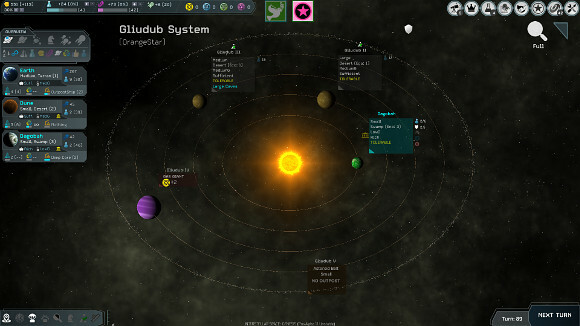 Events system added: The game now features colonization events, galactic events and exploration events! New playable race added - Meet the Sulak, the inhabitants of acid worlds! Race modifiers and special abilities: Each race now comes with its own set of modifiers and special abilities, including their own government. Race unique abilities: Among race modifiers and special abilities, each race has two unique abilities, which are like special powers the player can use during the game from time to time, when the necessary conditions are met. Starmap revamp! : New 3D objects added for all starmap objects; zoom and pan features added; old nebula graphics replaced with new procedural nebulas. System view revamp! : Previous "list-view" format replaced with an orbital view to show all the system objects (planets, gas giants, asteroid belts and accretion disks around black holes, neutron stars and exotic stars). Random tech trees option added! - When activated this setting generates differently arranged tech trees, that are different for the different players of a game. 9 powerful unique starships can now be found during ruins searching! POP assimilation mechanic added: Some races assimilate POPs faster upon invasion; POPs don't like to be conquered, so watch out for revolts! Hurry construction feature added: You can now hurry up construction with cash. New buildings: Space Elevator, Colonial Counterintelligence Agency, Intelligence Headquarters, Imperial Archive, Imperial Resort. New wonders: Galactic Navigation Archive, Galactic Space Port, Galactic Industrial Conglomerate, Galactic Knowledge Exchange, Galactic Relic Collection, Galactic Surveillance Network. Leaders opinion/intrigue mechanic added: Your leaders now have an opinion on you, which will reflect how much they like you, your empire and even some of the other leaders; higher opinion leaders gain more experience, while lower opinion leaders may underperform on their actions, so watch them closely. New leader desires/ambitions added: I wish "Shore Leave", "Get a Raise", "Dismiss Leader", "Colonize Planet", "Request Defense" and "Threat to Leave". New leader traits: Greedy (asks for raises and for more money), Philanthropic (less raise demands for less money), Envious (intrigue with other leaders), Xenophobic (only works for some races), Observant (better results from ruins exploration) and Fickle (loses opinion faster). New leader skills: Activist, Engineer, Medicine, Planetologist, Astrobiologist, Astronautics, Astroengineering, Weapons Specialist, Defense Technologies, Economics Specialist, Infrastructure Planner. Galactic Senate Victory condition added! - Gather two-thirds of the votes and win! New weapon modifications: - Continuous (increases accuracy); Shield Piercing (allows bypassing shields completely); No Range Dissipation (no damage penalties from range for the weapon); Fast (higher missile speed); Heavily Armored (harder to hit missiles); MIRV (each missile contains 4 separate full-strength warheads); Spinal Mount (only allowed for certain Titan ships - allows equipping super-sized mounts for weapons). Game resolution and quality settings can now be set in-game via the Game Settings menu. New star parsec distance measuring tool added. Cooperation in diplomacy new options "I request that you...": - "Declare War On..."; "Make Peace With..."; "Break Treaties With...". New art for all the races replaced the previous placeholder art, and there's animations too! Ship models complete rework for all races: new textures and new ship model set for the new Sulak race. Strategic resources related techs implementation done: Antimatter Warheads (bonus to missile damage); Neutronium Armor Coating (bonus to armor); Neutronium Shells (bonus to kinetics weapons); Enhanced Shields (bonus to shields); Beam Accelerators (bonus to beam weapons. Trade Goods was too good: Trade Goods now convert 10% of production to BC instead of previous 25%. Production taxes tone down: Production taxes now convert in the proportion of 1BC per 3 production points taxed instead of previous 1BC per 2 production points. Stellar Navigators now reduce nebula travel speed to 2 parsecs per turn instead of previous 1. Offworld Support tech now provides a free Support Ship upon tech breakthrough. Ship design limit changed from 5 to 12 (possibly unlimited at release). Techs of the same field and level now cost more research points every time a tech in the same field and level is researched. Trusting leader trait revised according to the new opinion and intrigue system. Maximum number of leader skills is now 5 (previously was 8). Rival factions now conduct diplomacy according to their attitude towards the other races: Diplomacy modifiers added (example: "You declared war on us! ", among many others). AI rivals keep memory of events and react according to the current state of affairs. Titan construction now requires a tech. AI now defends better: The AIs now have "situational awareness" for all nearby threats. They employ reactive defense maneuvers against forces perceived as a threat. AI trade proposal spam fixed: The AIs now propose deals more sensibly. AI now more likely to attack if the opportunity arises. Previously, the AI was a bit too cautious and passive. AI now equips their ships' weapons with modifications. AI now uses energy overload actions during combat. New Empire Overview screen added: Allows tracking all the important aspects about your empire at a glance! New Rival Empire Status Overview screen added: Shows information about all the factions you've made contact with. Ship support points now shown in yellow and in red when bellow -5 or -10 respectively. Tweaked the "New Turn" panel stripe, that presents the stardate and informs a new turn has started to stay visible for a bit more time. Colony view improvements: Now the buildings are shown in the colony (and can be scrapped); the terrain quality has improved significantly (and will improve further for the next releases). Complete replacement of the soundtrack with the new musics composed by Grant Kirkhope and Ryan McQuinn! Fixed an issue where the game was causing a freeze when generating terrains in particular cases. Fixed an issue where the leader skill icons would not fit the leader card panel when they were more than 4. Ship support bonus is now reflected in the game difficulty level tooltip at game setup. Fixed an issue where the race description text position did not reset to the top after scrolling the description of another race. Fixed a bug where the ships' armor was being updated when entering space combat. Fixed an issue where Leaders were having desires fire up for colonies before they arrived there (still in the process of being assigned - travelling). Fixed a memory leak in the starmap that was causing large amounts of unnecessary memory to be used. Fixed a bug that was causing a freeze when occupying an outpost in a very special case. Fixed a bug where you couldn't proceed with the game when every tech was researched. Fixed an issue where special system components space and cost requirements were not scaling with ship class size. Instructions on how to download the latest build can be found here.